The AM-500 is one of Amprobe’s low budget multimeters. Part of the 500 Series, it is the budget model of the range, yet has most ranges and can be used for everything from checking sockets and lights to motors, autos and HVAC systems. An easy to use meter with dedicated measurement ranges, it is also auto-ranging and has a data hold function, making it especially handy for non-professionals. 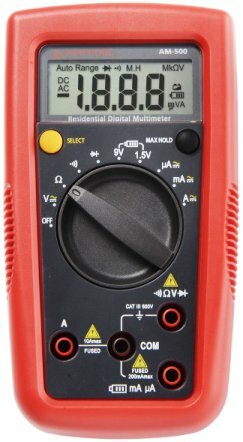 This is the most basic, easy to use multimeter of Amprobe’s 500 Series, but it nonetheless offers most of what a standard size meter has. AC and DC voltages can measure up to 600V, the high current circuit is good for 10A and is fused, and resistance can be measured up to 20MΩ. There is no capacitance or frequency ranges, though, so it is not great for electronics work. It is mainly for those into basic electrical maintenance, such as around the home or office, although the micro-amps function makes it a contender for diagnosing faults in heating and air conditioning units. A milliamps range is also available and, as such, there are four jack socket inputs. The battery test feature has dedicated dial positions for 1.5V and 9V batteries. Although accuracy is not great, you can check batteries more accurately under higher load as opposed to using the standard DC range. There is also a low-battery indicator on the screen, which notifies when the meter’s batteries need changing. This meter also has dedicated resistance, continuity and diode test range positions. It is less rugged than others, featuring a hard cover as opposed to a rubber boot. Although it has a CAT-III rating, the AM-500 is not suited to industrial environments where high energies and dusty, humid, hot environments can be the norm. There’s a tilting bail (kickstand) built into the rear and test lead holders. Entry to the battery compartment is convenient, via a single screw. Fuse access is more of a hassle as it requires the removal of the rear, which is often the case with cheaper multimeters. Despite being lower budget, this is an auto-ranging multimeter, meaning you simply select the measurement range and go – the correct range is then automatically selected. There’s no Min/Max or relative mode on this model, but you do get a data display hold. In addition is an auto power-down after 15 minutes. Every position on the 10-way dial selector is given over to its own measurement range, which is handy. You do, however, need to switch between DC and AC on the voltage and current ranges via the SELECT button. Note: multimeter is DC by default. Display: a bit disappointing, being small and fairly low count. This is a 2,000-count LCD display, or 3 ½ digit. You thus can achieve 1.999 units before it automatically changes to 2.00kΩ, for example. Display update rate is between two and three times per second, which is a bit sluggish. The facade is straightforward, with obvious range labels and just the two buttons to worry about. Jack inputs are standard and color coded. Safety standards are touted as CAT-III to 600V. You can thus use it on fixed installations within buildings, such as panel boards and socket outlets, or around the home. It is best to limit use to single phase systems. The Amprobe AM-500 is also UL-listed. Fuses: both current inputs are fused. These are fast-blow fuses, to 10A on the high current side and 0.5A on the low current side. Bear in mind that maximum current tested on the milliamps input is 200mA. You can use the AM-500 in commercial settings and also in light industry, but it is best suited to use around the home, garage, apartments buildings and schools, etc. It is ideal for testing batteries, continuity in wires and switches, voltage in socket outlets, appliance faults, and so on. The Amprobe AM-500 review has a useful multimeter for DIYers and those with standard electrical tasks. As part of the 500 Series, it has a reputation to live up to and, although basic and a bit slow, it has okay accuracy and some useful ranges. These include micro-amps and a battery test facility. Alternatively, the AM-510 is a full size, full range meter.